It’s a wise person who acknowledges: “I don’t know what I don’t know.” But for the benefit of everyone in the agency, it’s good for the agency owner or manager of the agency’s personal lines, commercial lines, or benefits department, to know what staff members don’t know about their supposed area of expertise. 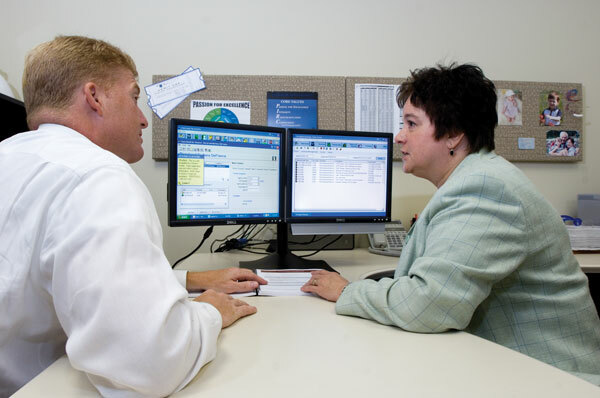 Karen Snedeker, director of education and business information for the Oswald Companies, headquartered in Cleveland, Ohio, reports that several members of the agency staff helped beta test a new service designed to gauge the insurance knowledge of prospective and current employees. The service is named “Hiring in Insurance Testing Service (HITS).” It was developed by management and technology consultant Virginia M. Bates, co-founder of VMB Associates, Inc., based in Melrose, Massachusetts. 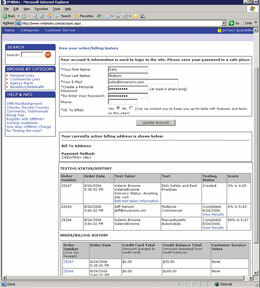 Bates rolled out VMBhits in April 2006. Candidates are able to take the test without coming into the Phoenix office. 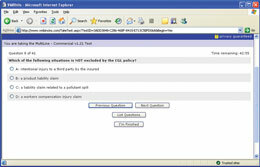 Harman provides them a link to the VMBhits Web site where the timed exam is available. “There’s adequate time to finish if you know your subject,” Harman notes. “However, there’s not enough time to research answers.” For the most part, though, she prefers that candidates come to the office for a face-to-face interview. She has a room set up where applicants can take the test. “By the time they come back to my office to tell me they’re finished, I have the results of the exam,” she says. Not only does Harman receive the individual’s score by area, but she also receives the candidate’s answers in addition to the correct answer should the candidate have answered incorrectly. This is helpful, she explains, because it helps her evaluate the candidate’s judgment and problem-solving skills. 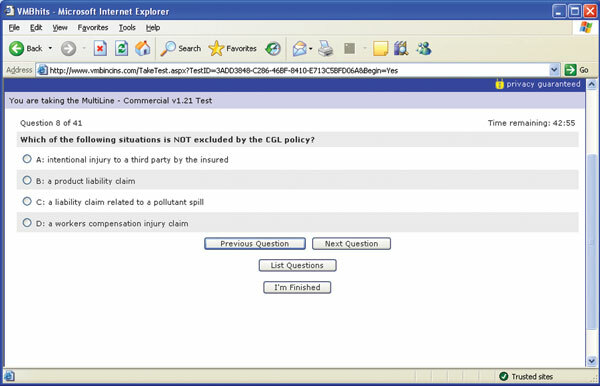 “Overall, this is a great tool to assess a candidate’s insurance knowledge, experience, and common sense,” she says, adding that she’s used the VMBhits Multiline - commercial test as well as the E&O Safety and Best Practices test. By using both tests she says she was able to learn about the candidates’ technical knowledge in addition to their understanding of procedures. At the Charles L. Crane Agency, headquartered in St. Louis, Missouri, Jane M. Scott, PHR, plans to use VMBhits in addition to other online assessment tools that the agency uses when considering potential new hires. Scott says once she’s reviewed a candidate’s resume, she follows up with a phone interview to assess the person’s attitude, personality, and phone skills. If it appears that the candidate will be a good fit, Scott e-mails an employment application and other pertinent forms. She also includes a link to the Omnia site so the candidate can complete the Omnia® Profile which identifies an individual’s tendencies in the workplace. When it’s time for the face-to-face interview, then, Scott has a good amount of information to discuss with the candidate—the results of the Omnia Profile in addition to her standard 14 questions which range from “What is your greatest strength?” to “What did you learn from your first job?” Following that, she administers the VMBhits exam. As of this writing, she’s used the VMBhits Benefits exam and one of the personal lines exams. “You can do behavioral interviews, but if a new hire doesn’t understand insurance, then you’re putting a good person in a bad situation, setting them up for a struggle. No one enjoys coming to work under those circumstances,” she says. Bates chose MWare, Inc., based in Quincy, Massachusetts, to develop the VMBhits exams and Web site. Additionally, MWare provides support for the site and processes payments. Jeff Matherly, who has more than 25 years of experience in a variety of technology and consulting roles, is one of the founding principals of MWare. He describes the VMBhits testing site as straightforward. “The real value is the ease of use from the administrator’s perspective,” he says. “The administrator can quickly order up a test and be able to see the results quickly after the test has been scored.” Communication on the site is secure via its SSL certificate. Matherly says the test questions aren’t tricky, nor are the exams tiered for beginners or advanced insurance practitioners. “Junior people in the industry who have had training will get about 70% of the questions correct. More senior people will get 80% to 100%,” he says. He goes on to say that VMBhits recently introduced tests that will verify basic competency in Microsoft Word and Excel. “It can be very disruptive when people can’t use these tools correctly,” he notes. Cross links are in place at both the Omnia and the VMBhits Web sites making it simple for visitors to either site to access information about the other. Carmen Edgehouse (seated) and Kate O’Donnell view a sample question at the VMBhits Web site. Edgehouse and O’Donnell are participants in the Oswald Companies’ Professional Associates Program—a fast-track education experience. David C. Jacobs, Executive Vice President (left), and Karen Brown Snedeker, CPCU, Director of Education and Business Information, both with the Oswald Companies, discuss additional ways to use VMBhits to foster the agency’s culture of self-development and self-improvement. One of the questions from the Multiline - commercial test. Note that the time remaining to complete the test appears at the right of the screen. 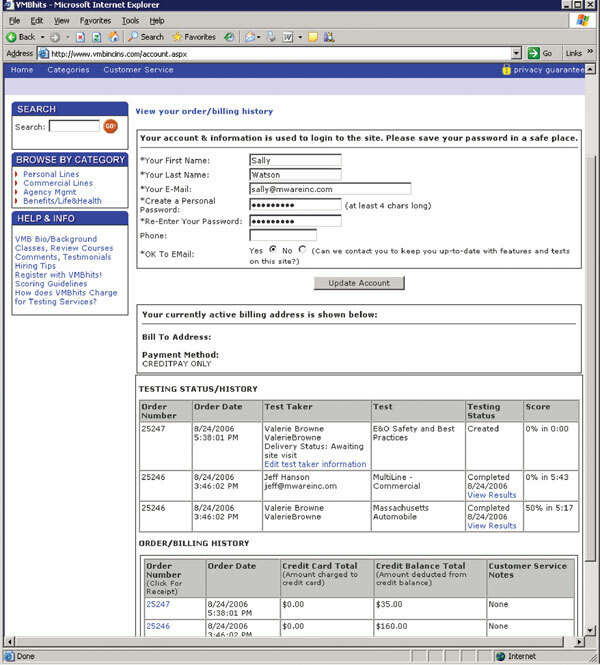 This screen capture illustrates how a test administrator can view testing history and status, as well as order and billing information.